One thing I learned about Seoul is that shops open and close so quick around here. One time, I was on my school break and went away from the city for vacation, and when I came back a month later, there were quite a bit of a change of the stores in some of the neighborhoods I frequent to. This time, since my last trip was almost 5 months ago, I thought I'd do a survey to my old neighborhood and see what's changed. Quite a bit I should say. 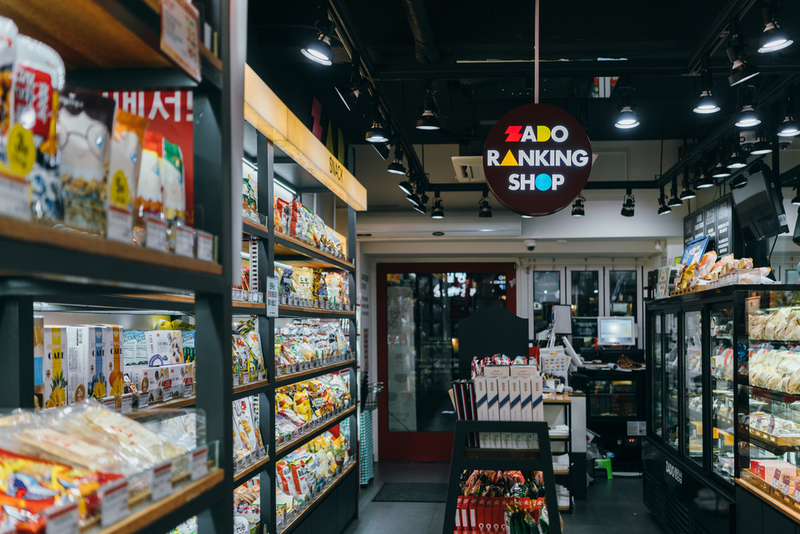 I ended up going inside Zado Ranking Shop (Zado 랭킹샵) at Sinchon (신촌) yesterday. I think it's a new snack/bakery store (cos it wasn't there when I was here last time) and if I'm not mistaken, they have ranks for different category of the items. Some of the categories are snacks, beverages, instant noodles, rice, and they even have unique one like 'blindtest'. Not sure what it actually means. The products sold on the store are not exclusively Korean, most of them came from different countries like Japan, America, and even Indonesia. I'm thoroughly surprised to see some of my favorite Indonesian snacks and instant noodles in this store (Indomie takes 2nd place in the Rice & Noodle category btw :P). I ended up buying a Japanese watermelon soda from this place, which tasted pretty good, and for my next visit I think I'm gonna try one of those Emergency Food Instant Rice that they have in store (see picture below) just to see what it tastes like.